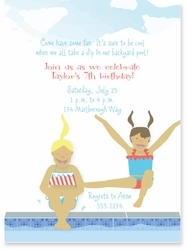 Perfect for a summer pool party, we know you'll love this customizeable swim birthday invitation with your child's likeness. Just leave us details about hair length and hair color in the comments section at checkout. Works well for non-birthday poolside get-togethers too!